Happy first day of spring. Thank god it is finally here because I thought I was going to vanish in to the abyss of this year’s winter. It’s funny because I believed it was going to be a mild winter this year. Even on New Year’s Eve is was above 0ºC and was raining. As far back as I remember in my adulthood New Year’s Eve always consisted of standing outside whatever venue we were trying to get in to and freezing our asses off, so I saw the mildness as a good sign. Needless to say Mother Nature was messing with us because shortly after the New Year it became one of the coldest on record. So to say that I am thrilled that spring is here is an understatement. I just hope it doesn’t morph in to summer too quickly. 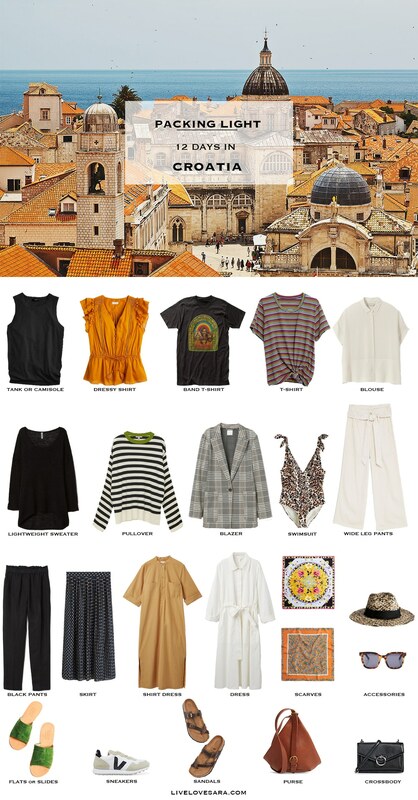 To commemorate this absolutely beautiful first day of spring I have an international packing light list for Croatia in the spring and summer. Croatia has become a hotspot destination for those that wish to experience the Mediterranean without the high costs and crowds of Greece, and Italy. There is so much to do that you may have to tweak the above choices if your itinerary includes a lot of active outings like hiking. If your trip focuses more on touring the town sites, and walking the beaches then this will work well. As a whole European style is more dressy than your typical North American fashion. Dressy doesn’t mean fancy, it just means pairing a dress top with some nice jeans, and flats vs leggings, and oversized sweater, and sneakers. Evenings also tend to be dressier, so make sure to include a dress that can be dressed up easily, nice trousers, or a skirt (which can actually give you more options than a dress with swapping around tops). Even during the summer it is good idea to include a sweater or something than can easily be tossed on to cover your shoulders when visiting any sites that require it. An oversized scarf works in this situation as well, and can also be used as a quick swimsuit cover. It can be quite windy (and cooler) on the Mediterranean, especially if you are going to be near or on the water boating. Keep that in mind when you are selecting the style of dress you would like to pack. Something longer, or less billowy is always a better choice. Quick note: You don’t need more than two swimsuits, but if you are a two-piece person you can get more bang for your buck by mixing and matching your separates. I am from Croatia and this is how my spring/summer wardrobe usually looks like. I would just ad in a pair of shorts! Thanks for this! I always forget to add shorts because I personally never wear them, but definitely yes to including a pair for those that do!